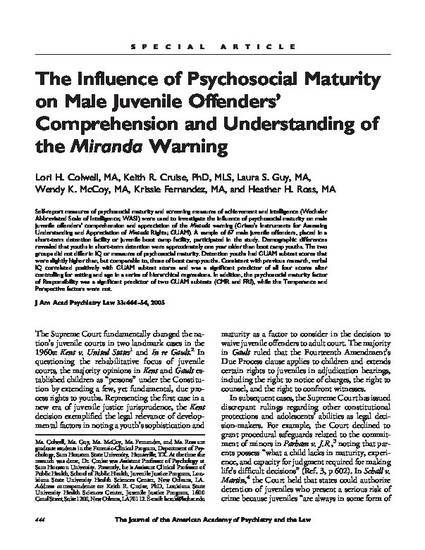 Self-report measures of psychosocial maturity and screening measures of achievement and intelligence (Wechsler Abbreviated Scale of Intelligence; WASI) were used to investigate the influence of psychosocial maturity on male juvenile offenders’ comprehension and appreciation of the Miranda warning (Grisso’s Instruments for Assessing Understanding and Appreciation of Miranda Rights; GUAM). A sample of 67 male juvenile offenders, placed in a short-term detention facility or juvenile boot camp facility, participated in the study. Demographic differences revealed that youths in short-term detention were approximately one year older than boot camp youths. The two groups did not differ in IQ or measures of psychosocial maturity. Detention youths had GUAM subtest scores that were slightly higher than, but comparable to, those of boot camp youths. Consistent with previous research, verbal IQ correlated positively with GUAM subtest scores and was a significant predictor of all four scores after controlling for setting and age in a series of hierarchical regressions. In addition, the psychosocial maturity factor of Responsibility was a significant predictor of two GUAM subtests (CMR and FRI), while the Temperance and Perspective factors were not. APA Citation: Colwell, L. H., Cruise, K. R., Guy, L. S., McCoy, W. M., Fernandez, K., & Ross, H. H. (2005). The Journal of the American Academy of Psychiatry and the Law, 33, 444-454.